Astilbe Mix | Gurney's Seed & Nursery Co.
Gorgeous even when it's not in bloom! Feathery plumes 2 ft. tall tower above foot-high mounds of burnished bronze-hued foliage spring through midsummer. Ideal for cutting if allowed to open fully. Prefers partial shade, but will do well in sun with regular watering. Mix of lavender, pink, white and red shades. 2-3 eye root divisions. Zones 4-9. 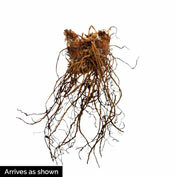 Depth: Plant crown 1 inch below soil surface. Light Required: Shade to partial shade. Color: All colors-white, pink red and purple. Foliage: Fern-like, dark green foliage. Soil Requirements: Sandy loam to clay loam, moist soil. Pruning: Cut back spent flower stems to keep the plant tidy. Cut back foliage in late Fall. 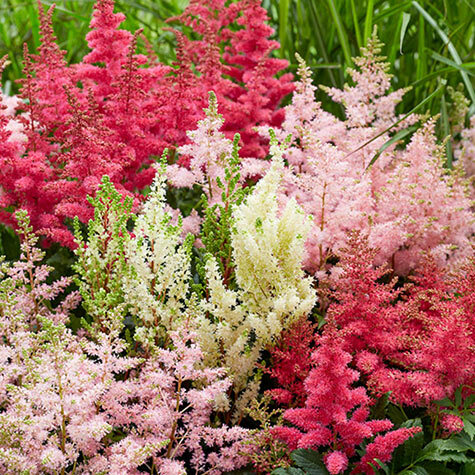 Comments: Astilbe are admired for their attractive foliage and sensational fluffy flower spikes. Great for the perennial border, in bed plantings or even containers! 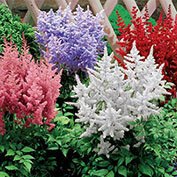 Blooming in June, July and August, this mix produces a mass of feathery flower plumes in red, pink, lavender and white. Lacy deep green or bronze-green foliage continues to add texture to your gardens. Plant in rich moist soil, in shade or semi-shade and in groups of 10 or more for maximum impact.